My extremely greasy skin with a tendency for blackheads on the nose needs thorough scrubbing at least twice a week. Homemade facial scrubs are my first choice and they are the best for my skin – no doubts about it. Nonetheless once in a while I do purchase and try some ‘natural scrubs’ also. 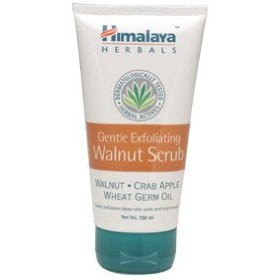 Amongst the several ones that I’ve tried, I’ve found that Himalaya Herbal Gentle Exfoliating Walnut Scrub is quite good. It has the goodness of walnut shell granules, wheat-germ oil and apple in it. Walnut shell granules gently exfoliate the skin to remove dead skin cells and blackheads while wheat germ oil, rich in natural vitamin E, moisturizes the skin and maintains its natural moisture balance and apple provides nourishment for a healthy, glowing skin. I gently massage the scrub over my damp face and neck in a circular motion avoiding the under eye area. Then I wash it off and gently pat dry with a soft towel. After use, my face feels fresh and healthy. Thanks for the post. I liked this.product. I've been wondering about this product. I think I'll add it to my beauty "wishlist" now! !